The University of Utah Seismograph Stations reports that an earthquake of magnitude 4.5 occurred at 06:48 PM on June 15, 2017 (MDT). The epicenter of the shock was located in Yellowstone National Park, eight miles north-northeast of the town of West Yellowstone, Montana. The earthquake was reported felt in the towns of West Yellowstone and Gardiner, Montana, in Yellowstone National Park, and elsewhere in the surrounding region. Today's earthquake is part of an energetic sequence of earthquakes in the same area that began on June 12. This sequence has included approximately thirty earthquakes of magnitude 2 and larger and four earthquakes of magnitude 3 and larger, including today's magnitude 4.5 event. 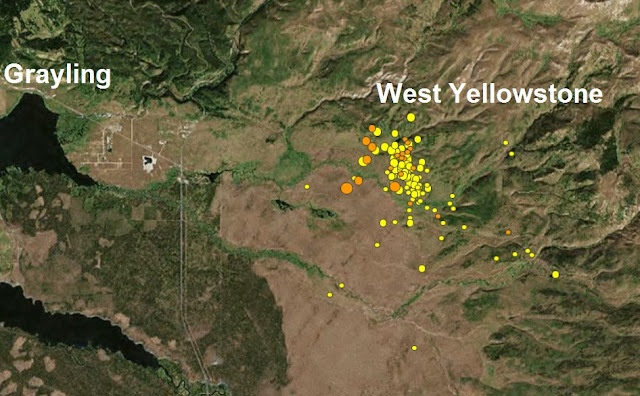 Today's earthquake is the largest earthquake to occur in Yellowstone National Park since March 30, 2014, when a magnitude 4.8 event occurred 18 miles to the east, near Norris Geyser Basin.